Pack Size: 100g Organic / USDA Certified. 100g Organic / USDA Certified. Organic Spirulina is a blue algae, found in the paradise-like tropical shores of South Asia. 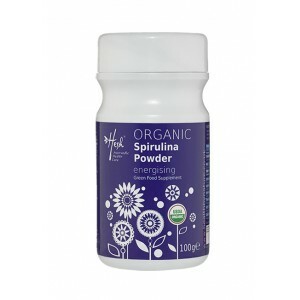 Spirulina is packed with vitamins, minerals, antioxidants, fibre, protein and chlorophyll. It's the perfect way to de-stress and detox naturally. Spirulina could be helpful as part of your diet plan. That's because spirulina is high in fibre, and high fibre foods helps you to feel fuller for longer, so you're less inclined to over-eat. According to the NHS, "Fibre is an Important part of a healthy diet. A diet high in fibre has many health benefits. It can help prevent heart disease, diabetes, weight gain, some cancers, and it can also improve digestive health". The calcium in Spirulina also contributes to the normal functioning of our digestive enzymes, while zinc contributes to the normal metabolism of carbohydrates, fatty acids, and macronutrients. When we're full of energy and life, we're more likely to be active and exercise. To lose weight, exercise is a key factor and vitamins B2 and B3 and iron help to reduce tiredness and fatigue. Vitamins B1, B2, B3, B6, and B12, and well as calcium and iron, support a normal energy-producing metabolism, and iron also supports the supply of oxygen in our body. Spirulina is very high in protein, and this helps in the growth and maintenance of our muscles, while potassium contributes to normal muscle function. The vitamins and minerals in Spirulina Powder such as vitamins A, B1, B2 and B3 and zinc, contribute to the health of your skin. Zinc also supports normal hair, and nails too! Antixoidants found in spirulina, including vitamins B2, and E, as well as manganese help protect our cells, DNA and proteins from oxidative damage. Oxidative damage is associated with premature ageing and certain types of disease. Potassium, calcium support normal muscle functions, and vitamin B1 contributes to the normal function of our heart. Potassium also contributes to the maintenance of normal blood pressure. The vitamins and minerals in spirulina powder are important for both our mental and physical health. Vitamins B1, B3 and B12 contribute to normal psychological functioning; Iron and zinc to our normal cognitive functions, and calcium to normal neurotransmission in our Brain. Vitamins B1, B2, B3, B6, B12 and potassium support the normal functioning of the nervous system, while zinc, iron and vitamin A support the health our immune system. The normal production of our red blood cells is supported by vitmains B2, B6, B12, and iron, which also supports the production of haemoglobin. 1 spoon (3.5g ) to be added to water, juice, smoothies or sprinkle over cereals.